Chiki Boutiki is also open for parents on opening day and offers great gift items for parents to leave at the front office for their campers. Campers enjoy shopping for snacks and souvenirs while they are on their “campcation” (just like parents when they are on vacation) and parents set up a spending account. Each camper’s name tag has a bar code that is also used for purchasing…and therefore money is not “lost at camp”. Camper spending accounts are not available for charges on opening day. The spending account is designed to cover any extra expense a camper incurs while at Riverview. Spending accounts are set up for each camper and purchases are deducted from those accounts. 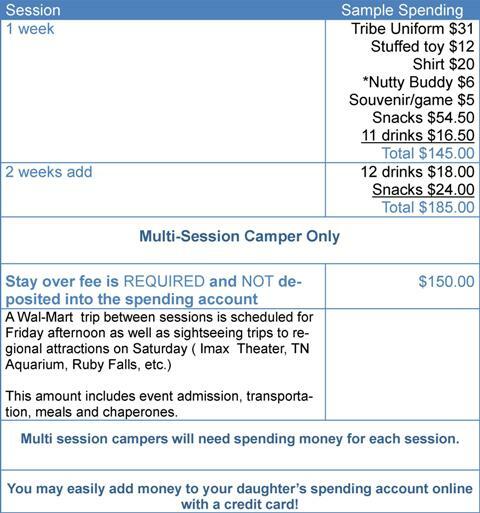 Please include your child's spending money and optional trip money with your May 1st camp fees payment, or at least a week before she arrives in camp. As a parent you should make your own decision about how much you would like for your child to have in her spending money account. Discuss with your daughter her spending options. The Snack area of ChikiBoutiki is open twice a day – We allow campers to purchase 2 snack items AND a drink each time at a cost of between $1 and $3 each. The Gift Shop area of ChikiBoutiki is open at various times throughout the session. The gift shop includes the Tribe Uniform (required), camp T-Shirts, specialty camp items, toiletry items, disposable cameras, souvenirs to bring home to family, etc. For your convenience, miscellaneous items such as stamps or personal hygiene items are also available. We make every effort to honor parent's wishes about spending limits. However, with hundreds of children to monitor, it is possible that your child could over-spend her account. We will try to email parents if account balances get low to see if more money will be added or if you wish us to implement a "stop spending" order to her account. However, even a stop spending order could be overlooked by mistake and result in a balance due at the end of the session. If your daughter is staying for more that one session, we have “extra events” planned over the weekend between sessions that require a separate fee in addition to spending money for each session. Any doctor or druggist bills incurred while at camp will be paid with parent's insurance where possible. Otherwise it will be deducted from the camper's spending account. Other expenses that may affect the spending account each session could include Nutty Buddy, and in 3rd session, Christmas in July. Requested refund checks will be mailed after summer when all medical bills and prescription charges have been paid and money returned from out of camp trips has been credited back to spending account. Money is held in the spending account for the next year if a refund is not requested and the balance is not transferred.